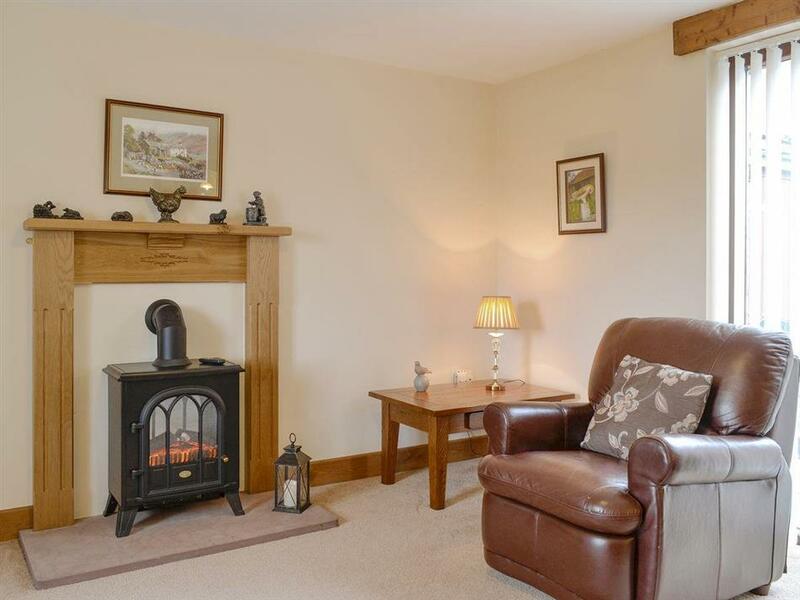 Little Meadow in Dearham, near Maryport, Cumbria sleeps 4 people. Little Meadow near Maryport is a modern barn conversion, with exposed oak beams, which provides the perfect hideaway for a romantic getaway or a fun-filled family holiday. 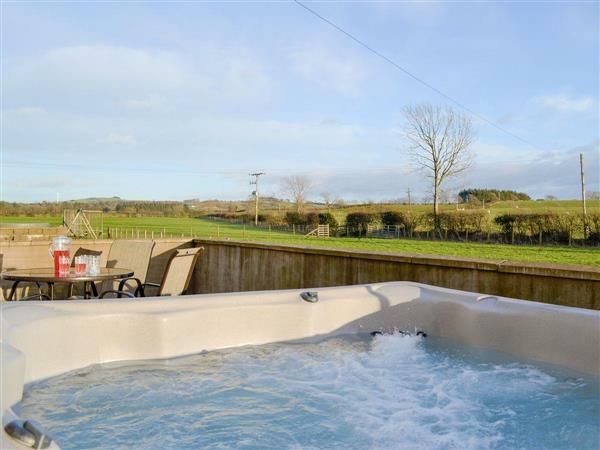 Complete with a private hot tub, you will have everything you need for a break surrounded by lush green Cumbrian countryside as far as the eye can see. Set on a working dairy farm, Little Meadow adjoins The Old Byre (ref UKC2999 [The Old Byre]) and can be booked separately to sleep up to four guests, or together to accommodate up to eight guests. Each of the beautifully designed rooms are keeping with the tradition and character of the barn, the bespoke solid-wood furnishings, fixtures and fittings have been engineered with quality and comfort in mind. Bathed in daylight thanks to the large windows, the ground floor features an open plan kitchen/dining room which offers an excellent social space. It is a great place to eat, drink and enjoy the tranquil surroundings. The separate living room, complete with leather sofas, provides a relaxing space in which to wind down after a day of adventure. Upstairs, you will find a king sized bedroom with an en-suite shower room, as well as a family bathroom and spacious twin bedroom with views across to the Lake District National Park. Open the patio doors, which lead to your own private patio complete with a hot tub and outdoor dining area. At night time, with a clear starry sky and just the changing lights of the bubbling water beneath you, life doesn’t get much better! Little Meadow offers you the best of both worlds. It is within a couple of miles of the Gem Town of Cockermouth, with its vast array of independently owned shops, coffee shops, wine bars and restaurants and Maryport with its historic Roman fort and harbour. Drive to the west and you can access the stunning coastline of the Solway Firth, with its sandy beaches and spectacular views over to the lowlands of the Scottish mountains. Drive to the east, and you have the awe-inspiring scenery of the lakes and mountains. Whether you love a gentle stroll, a challenging climb or a rugged bike ride, the UNESCO World Heritage Site of the Lake District National Park awaits. With an abundance of trails and routes around the 214 Wainwrights Fells and some of the most stunning scenery surrounding the great lakes, you will soon see what make this area of Britain so appealing. If you want to indulge in the local culture, the delights of Cockermouth, the birthplace of William Wordsworth, is just 3 miles away, as well as the famous Jennings Brewery which offers guided tasting tours. Take a 20-minute drive to reach the Lake District Wildlife Park at Bassenthwaite, which is where you will also find the Lakes Distillery, producers of fine whisky, gin and vodka. Continue your journey along the shores of Bassenthwaite Lake to reach the historic market town of Keswick, with a huge selection of traditional pubs, restaurants, shopping experiences and tourist attractions, including the famous Derwent Pencil Museum, home to the largest pencil in the world. The Theatre by the Lake offers award-winning drama and arts productions right on the shores of Derwentwater, one of the area’s most stunning tourist hotspots, and the kids will love The Puzzling Place, an attraction with mind-boggling optical illusions, great fun for all the family. The beach is 5 miles from Little Meadow near Maryport. With the shop 1½ miles, and the pub & restaurant are 1¼ miles from Little Meadow. Little Meadow can be booked together with The Old Byre (ref UKC2999 [The Old Byre]) to sleep up to 8 people. Living room: With electric wood burner, 32 Freeview TV, DVD player and CD player. Kitchen/dining room: With electric oven, electric hob, microwave, fridge/freezer, dishwasher, washer/dryer and patio doors leading to patio. Bedroom 1: With king-size bed, Freeview TV, iPod dock, beams and en-suite with shower cubicle and toilet. Bedroom 2: With twin beds and beams. Oil central heating, electricity, bed linen, towels and Wi-Fi included. Patio with sitting-out area and garden furniture. Large lawned garden (shared with other property on-site). Hot tub for 5 (private). Bike store. Private parking for 2 cars. No smoking. Holidays at Little Meadow run from Friday to Friday. For a better idea of where Little Meadow is, you can see Little Meadow on the map below. Little Meadow is in Cumbria; should you be on the lookout for a special offer, you can find all the special offers in Cumbria. It's always worth checking to see what is on offer at the moment. Do you want to holiday near Little Meadow (UKC2998), you can see other cottages within 25 miles of Little Meadow; have a look to find your perfect holiday location.